Continuing next in the itinerary series, in this post I will suggest a Leh Ladakh itinerary for 12 days. Like previous posts, I will suggest three different types of itineraries. First set is for people traveling by their own vehicle. Second is for someone traveling by public transport; either by Bus or shared cab. And the third set is for people planning to catch a flight to Leh and spending the entire 12 days in Ladakh itself. Is 12 days a good number for Ladakh trip? The answer to this question is a yes, but you may still be forced to leave a few places out of your itinerary. For example, people traveling by their own vehicle will be able to cover both Manali Leh and Srinagar Leh routes; but may not be able to see some local tourist attractions in Ladakh. Someone who is catching a flight to Leh will have more time in Ladakh; but will have to leave out traveling on both these highways; and will also either have to depend on public transport; or spend quite a bit of money on taxis. Irrespective of the above, 12 Days is still considered a good enough time for a trip to Ladakh. How can you plan your itinerary to make the most out of this time; and cover as many places as possible is what we will be talking about in this post. For the sake of this article, I will assume that you are starting your journey from Delhi. If you were coming from a different city, then only the travel details for first and last day will be different. Rest of the details for rest of the day will still apply. I will first detail an itinerary that I recommend; followed by a few alternate versions of the same journey. Depending on your mode of commute and preference; you can pick and follow either one of these. Before I go on providing further information on the itinerary, let me first explain why I am recommending traveling this way. Usually people prefer to reach Ladakh via Manali and return via Srinagar. I would however advise that you do the exact opposite of it and below is why. Also known as altitude sickness or simply AMS in short, this remains to be the biggest concern during a Ladakh trip. No matter how much the tourism increases, the fact remains that Ladakh is a high altitude desert; and when you travel here, you are bringing your bodies to a height that it has never been to before. While coming from Manali side, this gain in altitude is tremendous and quite sudden; leaving our bodies with little time to adjust. This is the reason why majority of people suffer from AMS on Manali Leh route; either at Sarchu, Pang or at any of the high altitude passes. On the other side, this rise in elevation is a bit gradual while going from Srinagar side; allowing more time for our bodies to acclimatize. And hence lesser chances of altitude sickness. For more details on what AMS is and what can you do about it, please read How to Handle Acute Mountain Sickness in Ladakh. A permit is now required to approach and cross Rohtang Pass from Manali side. This permit is a mandate and is issued on first come first serve basis. There is also a cap on the maximum number of permits issued per day due to which, getting this permit is quite hard during peak tourist season. It mostly remains bought out by the local taxi drivers in Manali and is just a hassle for anyone traveling to Rohtang Pass. There are two ways that you can get this permit; either online or in person from DM office. However you procure it, it just becomes an additional task that you will have to take care of. But if you were coming from Leh to Manali, and crossing Rohtang from the other side, then this permit is not required. So taking Srinagar Leh highway to reach Leh would avoid you the need of worrying about this permit as well. A check post has been set up at Gulaba where you are needed to submit your permit before moving on to Rohtang. On top of it, the number of tourists visiting Manali and Rohtang increases each year; due to which, the average wait time at the check post can be as long as 2 to 3 hours. You will find local taxis lined up here even at 4 AM in the morning. Even after you cross the check post, you will still run into traffic on the entire stretch of 50 kilometers towards Rohtang top. This just ruins the day really and becomes a nuisance. This problem too can be avoided by reaching Ladakh via Srinagar. Petrol pump in Ladakh still remains to be just the one in Leh city. However, Petrol and Diesel is now available almost everywhere in black. You can easily get fuel at Chadar tents or small shops for about Rs. 120 per liter. I have bought fuel in Diskit, Pangong, Hanle and Karzok but it is available at other places as well. Quality of the fuel however is questionable. So if you can manage to carry spare fuel that can last till next petrol pump, then please do so. If not, then ask around at the local shops and you can definitely buy there in black. 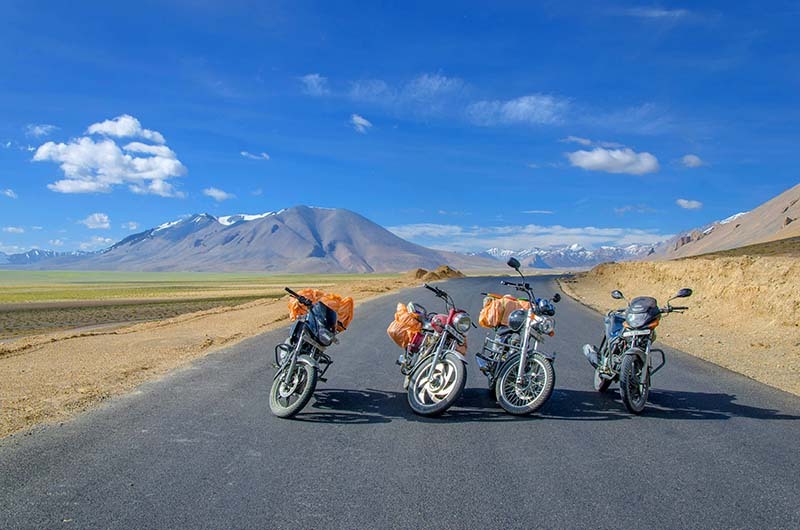 Read Fuel During Ladakh Trip – How to Manage for more details. Now let me run down the itinerary day by day for a better understanding of the journey. Not much to write about this day except for this will be a bit of long and monotonous journey. You will cover about 600 kilometers in 11 to 12 hours. Good news is that the road is good for most part of the journey. There are a few bad patches in between but only during the last stretch between Pathankot and Jammu. There will be a lot of tolls between Delhi and Pathankot though. Hotels in Jammu are available in plenty but stay at one closer to Jammu Srinagar highway. There are two ways that you can travel from Jammu to Srinagar. Either take the Jammu – Srinagar highway which runs a total of about 270 kilometers. Even this distance however will take you about 11 to 12 hours to complete; because heavy traffic and congestion on this route is quite normal. It will take you through the scenic towns of Patnitop and Anantnag; and condition of the road remains to be a mix of super smooth, smooth, bad and ugly. The second route is the historic Mughal road which runs through Rajouri, Peer ki Gali and Shopian for a total of about 330 kilometers. This is longer of the two roads but is also the more scenic one. Traffic too on this stretch is not that much. For more details; please read How to Travel from Jammu to Srinagar by Mughal Road. Once you arrive in Srinagar, you can either stay at a houseboat or a hotel as per your preference and budget. Destination for today is the small town of Kargil. Take an early start from Srinagar so that you can get some time for sightseeing as well en route. The entire stretch from Srinagar to Kargil is very scenic as it slowly transforms from the lush green of Kashmir to brown barren of Ladakh. Total distance covered will be about 220 kilometers in a total of 8 to 10 hours depending upon your speed and breaks. You will cross the towns of Kangan, Sonamarg and Drass on the way. The high altitude pass of Zoji La is the worst section of the road. Kargil War memorial at Drass is definitely worth a visit. Starting as early as possible is of utmost importance on this day; because there is so much of sightseeing involved. The maximum number of tourists attractions that you will cover on Day 4 will probably be more than any other days of the journey. Namika La and Fotu La will be two high altitude passes that you will cross before reaching Leh. Lunar Landscape, Indus Zanskar Confluence, Magnetic Hill, Gurudwara Patthar Sahib, Maitreya Buddha statue are some of the well known tourist places that will fall on the way. For a list of tourist attraction on Srinagar to Leh route; please read What to See on Srinagar Leh Highway – A Complete List. Hotels in Leh are available in plenty these days and in all budget. However, if you were traveling in peak tourist season then I would recommend that you call and book in advance. For a list of some recommended hotels, please read Good Budget Hotels in Leh City. Your first agenda for today is to arrange your permits; without which you will not be able to visit any other areas in Ladakh. There are two ways to go about it. Either you can arrange for the permit yourself from DM office in Leh; or you can pay your hotel to arrange it for you. A lot of hotels these days provide this service for their guests at an additional charge of Rs. 100 – 120 per person apart from the permit fee. You will have to ask your hotel though and if they deny then you will have to visit DM office yourself to arrange the permits. Once the permits are taken care of, you have the entire day to yourself for sightseeing. Leh Palace, Shanti Stoopa, Leh Market are some of the most common areas visited by tourists. For a complete list, please read Tourist Attractions in Leh City. Destination for this day is Nubra Valley. Once again, I will recommend an early start so you have time to visit some of the tourist areas in Nubra. Diskit is the headquarters of Nubra Valley and that is where you will stay for the night. From Leh, the road first climbs for 35 kilometers to Khardung La; and then descends into the valley via the village of Khardung. You will then reach Khalsar from where, a road bifurcates to the left and reaches Diskit. Total journey is of about 120 kilometers and can take you 6 to 7 hours to complete; depending upon your breaks and speed. Bactrian Camel, Diskit Monastery, Hunder sand dunes are some of the places that you can visit on this day. Read Tourist Places in Nubra Valley for a complete list of must visit attractions in Nubra Valley. You will now be heading to Pangong Tso; the beautiful lake blue which in last few years has become the very symbol of Ladakh. But before that, you will do a bit more of sightseeing in Nubra Valley. From Diskit, drive back to Khalsar and then take the road that goes towards Panamik. There is a hot water spring in Panamik which is worth taking a dip in. After spending some time, drive back to Khalsar again; and this time, take the Agham Shyok road to reach Pangong via Durbuk. At Pangong, you can either stay at the camp sites or as a paying guest in the village of Spangmik. On Day 8, you will return to Leh but will take a different road. You reached Pangong via Khardung La and Shyok road but for return journey, you will be covering mighty Chang La, incorrectly famous as the third highest motorable road in the world. Highest or not, it is definitely a very scenic drive which will take you about 9 to 10 hours to complete. Road is mostly good with a bad patch near Chang La top. From here on, it is mostly a return journey home while covering Tso Moriri and Manali Leh highway on the way. From Leh, drive all the way to Upshi and then take the road via Chumathang. You will then reach Sumdo and continue driving towards Karzok, the small village on the banks of Tso Moriri where you will be staying for the night. The road is mostly in good condition but the last 50 kilometers between Sumdo and Karzok is a complete dirt trail. The journey will take you about 8 to 9 hours so start accordingly from Leh. There are several hotels and guest houses at Karzok where you can stay for the night. For details, please read How to Plan a Trip to Tso Moriri. For the journey today, you will first drive back 50 kilometers to Sumdo and then take the road towards Tso Kar via Polo Kongka La. There are a few dhabas at Tso Kar where you can take a small break. This road will then merge into Manali Leh highway near Debring. You will start driving towards Manali and soon will reach Pang. Depending on how long you took to reach here, you can either stay at Pang itself or continue to Sarchu for another 70 kilometers. As a rule, if you were able to make to Pang by 3 PM, then you should continue to Sarchu. If you reached Pang at around 4 PM or later, then you should stay at Pang itself for the night. If you stayed at Pang then start as early as 7 AM because this is going to be a bit of a long journey. If you stayed at Sarchu then make sure you are on the way by 8 AM latest. You will cross 4 high altitude passes, drive on the entire Manali Leh stretch and reach Manali by evening at around 5 to 6 PM. The reason why I am so stressing on starting early is because the traffic at Rohtang will eat up at least 2 hours before you finally make it down to Manali. This is going to be one long and boring drive really from Manali back to Delhi. Total distance is of about 550 kilometers and may very well take you 14 to 15 hours to complete. Personally, this is one stretch that I hate driving on because of the long line of trucks that you encounter here; very annoying. And this is it. That was your Leh Ladakh itinerary for 12 days. This in my opinion is the best way to go about this journey; but there are of course several other way that you can change this into. Having 12 days in hand definitely gives you several choices of changing and tweaking your itinerary. Let me also suggest a few other examples as well in case you did not like the first itinerary. The journey described above was best for someone traveling by their own vehicle. If you were however planning to use public transport service for the trip, then you can plan it in the following manner. This itinerary is via Manali rather than Srinagar because in my opinion, reaching from Manali to Leh by Bus is easier than Srinagar to Leh. Board a Bus from Delhi to Manali first. Then board the Manali to Leh bus which completes the journey in 2 days with a night halt at Keylong. For visiting Diskit and Pangong, go to Leh Bus stand early in the morning. If there is no bus available then board a shared cab going that way. Next day, you will return to Leh by shared cabs again. You have no choice but to come back to Leh from both these places because there is no public transport on internal routes like Shyok road. You will really have to give up Tso Moriri in this itinerary. There is no way that you can cover that as well unless you could add at least 2 more days to the trip. The Leh Srinagar Bus starts at noon from Leh and travels non-stop to Srinagar for 18 – 20 hours. So either you can break the journey in 2 days by traveling from Leh to Kargil and Kargil to Srinagar. Or you can spend first half of Day 9 sightseeing in Leh City and board the Srinagar bound bus at noon. This bus will get you to Srinagar early in the morning which will give you the entire Day 10 for some sightseeing in Srinagar as well. If you were flying into Leh City and have entire 12 days to spend in Ladakh itself, then your itinerary can be like the one mentioned below. The one day I left as buffer here can be spent at any place of your liking mentioned in the itinerary. In my opinion though, I will recommend that you use it as Day 2 and stay in Leh city only for another day. People catching a flight to Ladakh are most prone to AMS and allowing an additional day before going to Diskit via Khardung La will give your body some more time to acclimatize. I suggested the first itinerary starting from Srinagar and ending at Manali. But if you wanted to then you can definitely do the journey other way around as well. Staring from Manali, your itinerary then will change into something like this. There is another way that this itinerary can be changed starting from Manali. You will be able to incorporate a visit to a couple of more places in Ladakh but will have to ask someone in Ladakh to arrange your permit in advance. The best option is to contact a hotel and if they agree to arrange the permit, then book your stay with them. You will send your IDs and payments in advance so that when you arrive in Leh, your permit will be there already waiting for you. You will complete Manali to Leh journey in 2 days and collect your permits from the hotel once you reach there on Day 3. Whatever little sightseeing you can do in Leh city will have to be squeezed into the evenings of Day 3 and Day 8. If this is your second trip to Ladakh and this time you want to cover Zanskar valley as well; then you can plan your itinerary like the one below. A lot of people try to cover a bit of both Ladakh and Kashmir in their trip. You too can do that by planning your journey like below. But you will then have to reach Ladakh by air and fly out of Srinagar. It cannot be a complete road trip from your home. You will land into Leh, rent a private taxi for Ladakh sightseeing and journeying to Srinagar; do some sightseeing in Kashmir and then fly out of Srinagar airport. Keep in mind that for visiting places in Kashmir, your Ladakh registered cab will not do and you will have to rent another cab in Srinagar. Your sightseeing in Srinagar will then have to happen on Day 8 and Day 11. Pahalgam to Srinagar is just about 3 to 4 days of travel time so you can use this day for visiting places in Srinagar City after you reach there. This is another version of an itinerary covering Ladakh and Kashmir both. In this particular one, you will give up Hanle and Tso Moriri in favor of gaining more time in Kashmir valley. Your journey on Day 6 and 7 will not be that long. On 6th day, after you reach Sonamarg, plan a trip to Thajiwas Glacier which is highly recommended. On Day 7, it will not take you more than 3 hours to reach Srinagar after which you can visit some of the local places in the city. The itineraries I mentioned above are just a few of numerous ways that you can complete this journey in. You have 12 days in hand which gives you ample of opportunities to tweak your plan and cover as much as possible. I hope the information above on Leh Ladakh Itinerary for 12 Days was of help. If you have any other questions, please feel free to ask in the comments section below; or at our Community Forum; and I will be glad to answer. Whether can see Wular Lake from Gulmarg to Sonmarg by road? No you cannot. For Wular Lake, you will have to take the road towards Gurez Valley. You are welcome brother. Let me know how your trip went after you return. Whether Govt bus journey from Srinagar to Leh and Leh to Manali or Manali to Leh and Leh to Srinagar on Sept to Oct? In September yes it will be but not in October.